Why do we consider article 13 (that's actually article 17 in the newest version of the directive) so evil again? A lot of misinformation surrounds this topic, and I feel like people generelly have a misconception about what it's actually all about. Because it imposes legal liability for piracy on any internet platform that is over 3 years old OR earns a lot of money OR has a lot of followers. At the moment, the platform has to remove material when asked and the uploader is legally responsible for it. Under Art 13, the platform itself would be legally responsible, even if they removed the material when asked. The law doesn&apos;t call specifically for filters, but filters are the only way to obey what the law calls for. Yet free open source platforms have been excluded from this, and as such the Fediverse is largely unaffected by the directive. The actual losers in the situation are big American companies like Google and YouTube, who'll have to buy licenses. As far as I know, it covers all platforms (open source or otherwise) that get any kind of income. Happy to be corrected if you can point to the relevant section of the legislation. 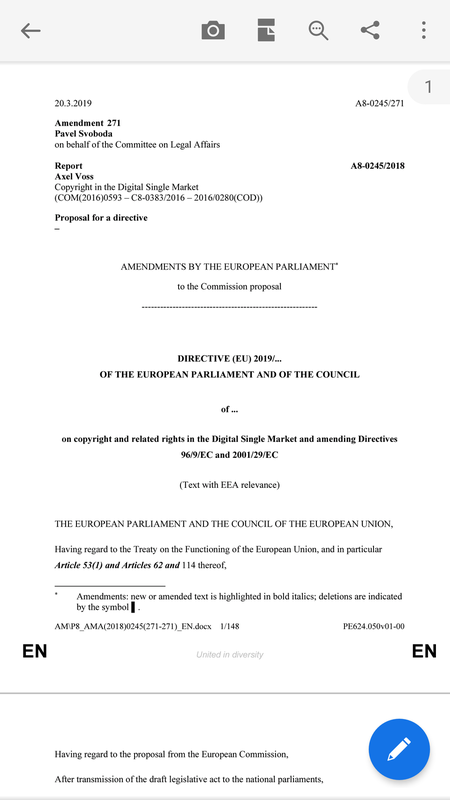 I'm not sure about the paragraph, but there is a website called article13.org (check it out here: https://www.article13.org/article-13) that explains and analyses the whole directive. The EU Council also shared a video on linkedin, stating the same. The directive also states, that a platform may not block users from uploading content that falls under fair use. With all due respect, that site seems more like a promotional one than a neutral one ("creators rejoice!" etc). It would be useful if we could stick to the actual final text rather than interpretations of it, because there have been so many amendments and spin attempts. Yes, it seems like propaganda, but what is written makes sense. "Providers of services such as open source software development and sharing platforms, not-for-profit scientific or educational repositories as well as not-forprofit online encyclopedias should also be excluded from the definition of online content-sharing service provider." There was some discussion about this part some time ago. One problem that came up was, what is "not for profit"? In some countries, any platform that takes donations is seen as "for profit". I&apos;m guessing we will not know what the effect of this law is until it has been through court cases. Which countries? I'm too tired to look things up right now, so I'm only writing what'd on my mind. It's not really a law. It's a directive. So it's basically only a vague goal that every member state will try to adapt. If all goes well, the directive will come into effect in 2 years. After that, every memberstate will have to adapt it, writing their own national law about it. This could take (according to the EU council) something between 12 and 18 months. Apparently Germany is an example. But yes, this will take years, and each country may interpret this differently. I guess the worst problem is going to be in countries with governments that are very keen on the idea of upload filters, because this is perfect cover for them. They don&apos;t even have to take responsibility for such laws, they can just claim the law is Europe-wide (and leave out that they voted for them). Then again, the directive will grant you the right of uploading. This means, that if a website blocks your upload, and you deem it unjust, then you can take it to court. Platforms are also forced to create individual contracts with creators/artists. To be fair, I don't think the directive will have negative effects. Well, that&apos;s part of the problem. The law simultaneously makes websites legally liable for stopping piracy *and* allowing fair use. No technology will ever do this perfectly, so websites will in effect be legally at risk as soon as they accept any kind of uploads. Sooner or later, they *will* be in breach of the law due to imperfect filters. The only sites that can cope with this sort of situation will be very large (where they have lots of cash to settle court cases). The problem with Article 13 is that it&apos;s more of a wishlist than a practical law. Most of the people arguing in favour of it are saying it would be a good idea if it works, but cannot explain how it could work in the real world. Then, when the practical problems are pointed out, they accuse people of being too pessimistic about future tech development. But that is a terrible approach to laws. We should wait for the tech to exist before mandating its use. Article 13 seems to have been written with the intention of making YouTube etc buy licensing agreements with content makers, which is fine. Google has the money, content makers deserve a cut of whatever Google is making from their content. But the actual law goes way beyond this intention, turning the internet into something where everything we post (including short bits of text) has to be checked and potentially censored by third party companies before it can be displayed. @switchingsocial Na, that's just superstition. I mean, it *could* happen, but I don't think it will. Erm... that&apos;s what the law requires? Sites covered by the law have to guarantee that no unlicensed copyrighted material will be uploaded. This covers all material, including text. There are only three ways to comply with the law: license all material, manually check all uploads, or automated filters. Licensing all material is impossible (too many copyright holders). Manual checking is impossible (too much to check by hand). That just leaves automated filters. This is,it is difficult to detect if the media has a license or not. Andwasnt the open source exception just for software forges?